where BP is blood pressure, CO is cardiac output, SVR is systemic vascular resistance, HR is heart rate, SV is stroke volume, MAP is mean arterial pressure, SBP is systolic blood pressure, and DBP is diastolic blood pressure. Stroke volume is dependent on preload, afterload, and contractility (Fig. 8). Blood pressure can be defined to consist of three components: systolic blood pressure, mean arterial pressure (MAP), and diastolic blood pressure. Systolic blood pressure is the peak pressure during ventricular systole, MAP is used clinically as a crucial determinant for adequate perfusion of the major organs, and diastolic blood pressure is the main determinant for myocardial perfusion. Recall that the majority of coronary blood flow occurs during diastole. 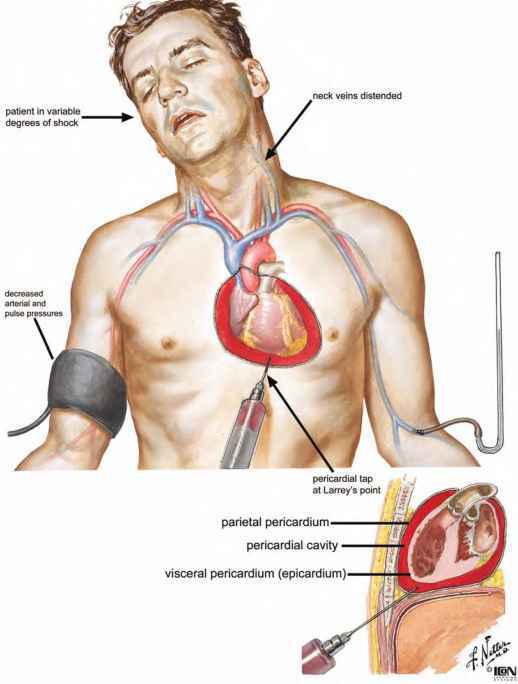 In general, arterial blood pressure monitoring involves two techniques: noninvasive (indirect) and invasive (direct) methods. The decision to utilize either blood pressure monitoring method depends on multiple factors such as cardiovascular stability or instability, need for frequent arterial blood samples, frequency of blood pressure recordings, or major surgery and trauma. One of the advantages of an invasive blood pressure monitor is that it provides continuous, beat-to-beat blood pressures (see JPEG 1 on the Companion CD). Direct arterial blood pressure monitoring is considered a requirement during cardiopulmonary bypass surgery. Because there is no pulsatile flow during such surgery, the noninvasive methods to monitor blood pressure cannot be employed. Noninvasive blood pressure assessment is the most utilized and simplest technique to monitor arterial blood pressure. This technique utilizes a blood pressure cuff and the principle of pulsatile flow. A blood pressure cuff is applied to a limb such as forearm or leg and is inflated to a pressure greater than systolic blood pressure, which stops blood flow distal to the inflated cuff. As the pressure in the cuff is gradually decreased, blood flow through the artery is restored. The change in arterial pressure and flow creates oscillations that can be detected by auscultation of Korotkoff sounds and oscillometric methods. For accurate blood pressure measurement, the width of the cuff should be approximately one-third the circumference of the limb. A small, improper size cuff will overestimate systolic blood pressure; a large cuff will underestimate the pressure. 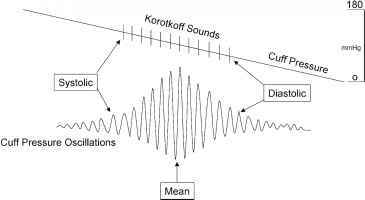 The rate of cuff deflation should be slow enough to hear Korotkoff sounds or detect oscillations. Noninvasive blood pressure monitors do not work if there is no pulsatile flow. The automated method of noninvasive blood pressure monitoring is the oscillometric technique. 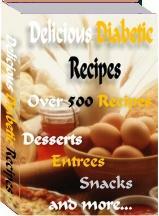 Oscillometric blood pressure monitors are basically composed of oscillotonometers and a microprocessor. The blood pressure cuff is inflated until no oscillation is detected. As the cuff pressure is decreased, flow in the distal blood vessel is restored, and the amplitude of oscillations increases. A large increase in arterial wave oscillation amplitude is recorded as systolic blood pressure, the peak oscillation as MAP, and the sudden decrease in amplitude as diastolic blood pressure (Fig. 9). Because of the relative sensitivity of such a monitoring system, the MAP is usually the most accurate and reproducible measurement. For more details on such monitoring, refer to Chapter 14. Continuous blood pressure monitoring is best accomplished by direct intraarterial blood pressure monitoring. Direct pressure monitoring allows for continuous, beat-to-beat monitoring of arterial pressure, and the recorded arterial waveform provides information relative to cardiovascular function. Direct pressure monitoring is often obtained in clinical settings such as major trauma and vascular surgery, sepsis, and cardiopulmonary bypass, for which there is no pulsatile flow. Further, patients with significant cardiopulmonary disease may require invasive arterial blood pressure monitoring (Table 1). As noted, besides providing blood pressure information, the arterial waveform also presents information about cardiovascular function. For example, the upstroke of an arterial waveform correlates with myocardial contractility (dP/dT), and the downstroke gives information relative to peripheral vascular resistance. The position of the dicrotic notch gives insights regarding the systemic vascular resistance; e.g., a low dicrotic notch position on the arterial waveform may infer low vascular resistance, and a high dicrotic notch usually relates to higher systemic vascular resistance. Furthermore, by integrating the area under the curve of the arterial waveform, the stroke volume may also be estimated. Fig. 9. Noninvasive blood pressure monitoring. As blood flow is restored with release of the blood pressure cuff, the arterial wave oscillations increase. The increase in oscillation amplitudes is associated with systolic blood pressure and presence of Korotkoff sounds. 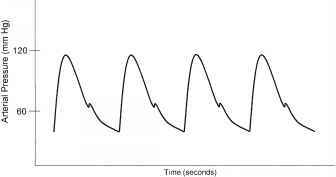 The peak of oscillations is associated with mean arterial pressure. Return of oscillations to baseline is diastolic blood pressure and end of Korotkoff sounds. Fig. 10. Arterial blood pressure wave. A typical optimally damped arterial blood pressure waveform. The peak portion of the waveform corresponds to the systolic blood pressure and the trough corresponds with the diastolic blood pressure. The dicrotic notch is associated with closing of the aortic valve. Information about cardiovascular function can be estimated from the waveform. The upstroke correlates with myocardial contractility. The downstroke and position of the dicrotic notch give information about systemic vascular resistance. The stroke volume is estimated by integrating the area under the curve. tors of a Wheatstone bridge circuit (see JPEG 4 on the Companion CD). The transducer is constructed using such a circuit so that voltage output can be calibrated proportional to the blood pressure. Standard pressure transducers are calibrated to 5 |iV per volt excitation per millimeter of mercury (1). Commonly, the electrical signals from such pressure-monitoring systems are filtered, amplified, and displayed on a monitor, thus providing a typical arterial pressure waveform. It is important that the arterial pressure transducer be positioned and calibrated accurately at the level of the heart; an improper transducer height will result in inaccurate blood pressures. If the pressure transducer is positioned too high, the blood pressure is underestimated; a lower positioned transducer will overestimate the actual blood pressure. diastolic blood pressure lower, and the MAP is usually similar to central aortic pressure. The pressure waveform becomes more distorted as pressure is measured farther away from the aorta. This distortion is caused by a decrease in arterial compliance and reflection and oscillation of the blood pressure waves. 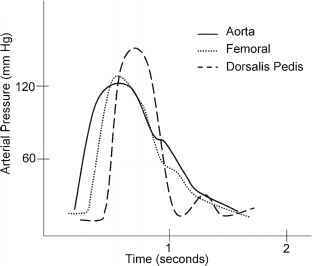 For example, an arterial pressure wave monitored from the dorsalis pedis will be significantly different from a central aortic wave when it is graphically displayed (Fig. 11). There is also a loss in amplitude or absence of the dicrotic notch, an increase in systolic blood pressure, and a decrease in diastolic blood pressure. One should also be aware of the possible appearance of a reflection wave as the blood pressure is monitored from a peripheral site. Importantly, risks associated with an indwelling intraarterial pressure catheter include thrombosis, emboli, infection, nerve injury, and hematoma. Fig. 11. Arterial pressure wave. The arterial waveform is recorded from the ascending aorta. As the pressure monitoring site is moved more peripherally, the morphology of the waveform changes because of changes in arterial wall compliance as well as oscillation and reflection of the arterial pressure wave. Notice in the dorsalis pedis arterial waveform the absence of the dicrotic notch, overestimation of systolic blood pressure, and underestimation of diastolic pressure. Also note the presence of a small reflection wave. How does a noninvasive blood pressure oscillation? Is blood pressure useful for monitoring heart failure?